Docsvault's Profile tool offers you to store additional information related to any document. They offer a cue about the document and it's contents so you can identify them instantly. Moreover, they broaden the search criteria in case you forget the name and description of files. 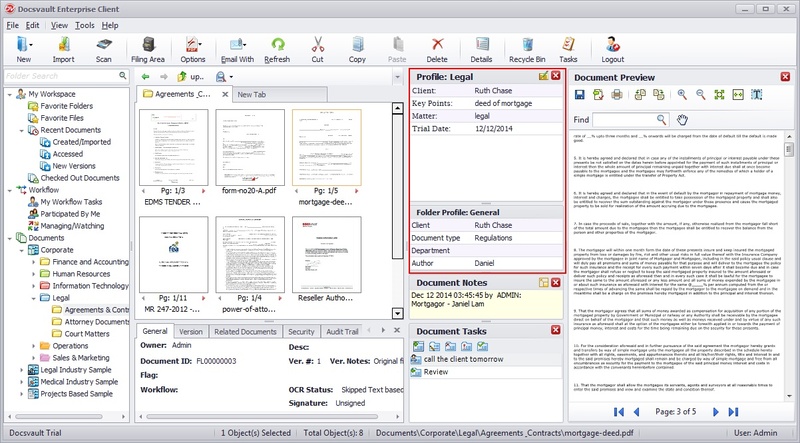 A 'Profile' can be assigned to documents when they are imported into Docsvault. If you desire, the document profile and it's corresponding index values can be changed from Properties dialog box or click on Edit Properties button in the right profile panel. When you select a document in the List view panel, you will find the profile and its relevant index values listed in the Profile panel in the right hand corner of the Docsvault Explorer. You can view the profile of top level folder (1st level) in right information panel in addition to the document's own profile values. To view the folder profile, enable ''Display profile for the first level folders...' in the properties of a cabinet. To hide the Profiles panel, from the View menu deselect Profiles from Right Panel or click on Cross button on the Profiles panel. •Only the Administrator or the Users with system rights of 'Create Profiles/Indexes' rights can edit and create new profiles and properties. However the index values can be changed by any user who has 'Overwrite/Delete' rights on the document.